You can say this about Press Democrat editor Ernest L. Finley: He didn't shy from making enemies and picking fights. At best, he was the tireless champion of anything that might bring prosperity to Sonoma County; at worst he was a relentless bully and yellow journalist who kept Santa Rosa bound to its 19th century ways. Today his name is remembered for the generosity of the Ernest L. and Ruth W. Finley Foundation (although that wasn't founded until decades after his death) and his determination in the 1930s to build the Golden Gate Bridge, despite efforts by railroad interests to organize a boycott of his newspaper - "Damn the circulation! The bridge must be built!" remains his most famous (and likely apocryphal) quote. The usual hagiography paints him as a humble small town newspaper editor who preferred to jaw with farmers over the price of hops and hogs, but he was much more complex than that. In the first four decades of the Twentieth Century, no man or woman cast a longer shadow on Santa Rosa history than Ernest Latimer Finley; favorite son Luther Burbank might have been the town celebrity, but Finley was the kingmaker, the media baron of print (and later, airwaves), the superarbiter of almost everything that happened north of the Golden Gate. Finley blazed a trail that directly continued into the era of Codding before arriving at the place we live today, better or worse. In the handful of years between 1904 and 1909 Finley would deny he was the most divisive person in town, although he declared all-out war five times, usually resorting to ad hominem attacks against his antagonist as well as the politician or group he opposed. Even in the knockdown world of turn-of-the-century newspapering, this was playing rough. His longest running feud was with Allen B. Lemmon, editor of the rival Santa Rosa Republican. During the run up to the 1904 elections, Finley and Lemmon were both throwing sharp elbows as they championed their party's candidate for Congress. Finley, however, played foul by publishing a dialogue between Lemmon and the Republican nominee where the editor supposedly denounced his own candidate as a liar and a coward. The Press Democrat named no source for the quote or gave any indication of how they could have been privy to know about such an argument, much less the exact words said. Shortly after that election, Lemmon stepped away from the Republican newspaper for a time and leased it to a pair of experienced newsmen from out of town. Finley (un)welcomed them with a pair of snide parody ads that cast them as snooty city slickers, "having just passed under control of people from the big town, who never saw a pumpkin in their lives, will henceforth be devoted to the pleasant, though arduous task, of teaching metropolitan ways to hayseeds, and introducing city culture to the backwoods" Finley also wrote snarky little editorials when the newcomers dared criticize the City Council. 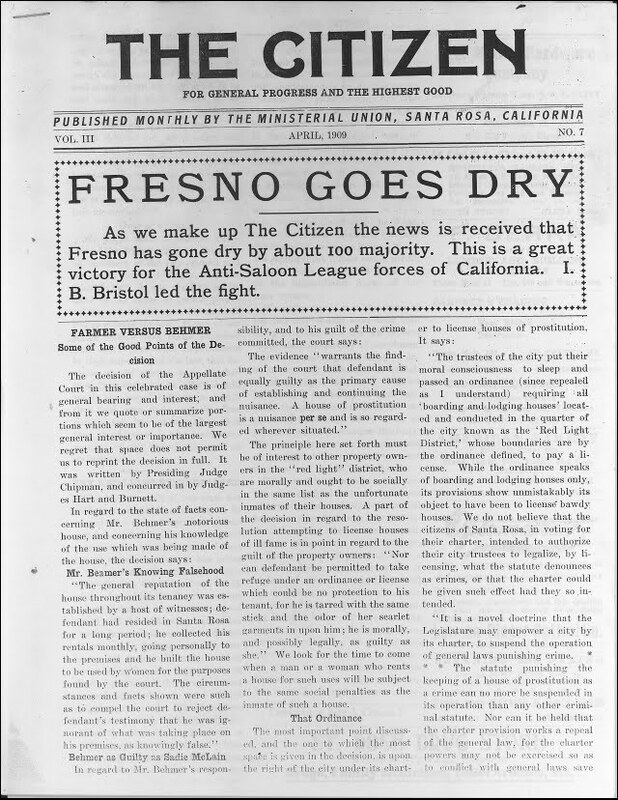 After the Republican's new editors became muckrakers and broke Santa Rosa's omertà to reveal that the town thrived upon an underground economy of prostitution and illegal gaming, Finley tossed out a red herring that the "real issue" was the Republican paper printing short market crop prices, thus somehow undermining local hop growers. And when the Republican raised questions about graft and corruption before the 1906 city election, the Press Democrat charged them with playing cheap partisan politics. If Ernest Finley festered perpetual grudges against his newspaper rivals, he reserved his unbridled contempt for the citizen reformers who wanted to clean up their town. To Finley, reform came with the risk of negative publicity that would damage Santa Rosa's "good name abroad." Unmentioned was that should a reform movement gain traction, they could follow contemporary San Francisco in calling for Grand Jury hearings, which in Santa Rosa might risk indictments of the downtown property owners and businessmen who profited from the town being the Sin City of the North Bay. Finley first took aim at the Good Government League, a short-lived group formed in 1905 to "secure the nomination and election of competent and trustworthy men for office" and encourage "honest and vigorous investigation of civic affairs." It was hardly Occupy Wall Street activism, but Finley wasted no time in comparing them to vigilantes and violent hate groups. Finley's wild charges quelled only after it was revealed that the League vice president was none other than Santa Rosa's lionized Luther Burbank. Now calling themselves the "Municipal League," reformers mounted a serious effort at winning city political offices in the 1908 election. The Press Democrat immediately accused them of being a stalking horse of "the church element," although it was apparent that the new League was an alliance of prohibitionists, anti-corruption progressives, and voters angered over the City Council's legalization of Nevada-style prostitution. Finley called them liars with a secret agenda to turn Santa Rosa "dry" and who were agitators stirring up "hard feelings" in town using "cowardly and un-American" tactics. (At least this time Finley had the good sense to delay mentioning the reformers had Burbank's endorsement until the last possible moment.) After weeks of mud-slinging and dissembling and having pissed off a goodly portion of the town, there were grumblings about a boycott of the Press Democrat. In response, Finley had the gall to claim the PD "never intentionally misrepresents things." Finley's keep-the-status-quo ticket won the election, and he was elected president of the Chamber of Commerce, following the man who was now the mayor. Nothing more was heard from the Municipal League, which presumably dissolved after losing at the ballot box. It was time to let tempers cool and animus fade. But that wasn't how things were done at the Press Democrat; Ernest L. Finley always kept slugging away until no opponent was left standing. His main target was now the Santa Rosa Ministerial Union, which was "the church element" that had supported the Municipal League. In a rambling editorial that clocks in at almost 3,000 words, Finley rehashed issues from the election half a year earlier to defend the city leaders he endorsed and continue bashing the Ministerial Union along with their monthly newsletter, "The Citizen" (UPDATE HERE). The Press Democrat editor told readers that the Ministerial Union represented a "radical element" whose "fanaticism, vicious and uncalled-for attacks" on Santa Rosa administrators was responsible for dividing the town. Finley declared "more ill-feeling was engendered here during the last city campaign than during any other similar period in all the town's history. The most bitter and uncalled for personalities were indulged in, and unfounded charges were hurled right and left with no thought of responsibility and apparently without regard to their truth or lack of it." So who were these malcontents that Finley portrayed as the enemy of the town? Of the 12 churches in town, eight apparently belonged to the Ministerial Union, according to a directory that appeared in The Citizen. Members included all three flavors of Methodist (Southern, Episcopal, and German), the Baptists, and four kinds of Protestants. The congregations that didn't belong were the Catholic church, the Unitarian church, and the two Lutheran churches. Much of Finley's harangue centered on the issue of prostitution. Both the reformers and the status-quo "fusion" ticket vowed to repeal it in the 1908 election. Finley's fusion boys won, quickly repealed the prostitution ordinance - and then did nothing to enforce it for more than a year, aside from arresting a few women for illegally selling booze. But what could they do? lamented Finley. "All the history of the world goes to show that when 'driven out' this form of vice invariably returns in another and far worse guise, distributing itself through the residence districts, establishing itself in hotels and lodging houses." What Finley disingenuously neglected to mention was that Santa Rosa was unique in the region for turning prostitution into a major industry, with no fewer than 8 or 9 bordellos operating here at the time - nearly one whorehouse for each church. That's a statistic that probably didn't make the Chamber of Commerce tourist handouts. Finley was also muchly troubled by the churches in the Ministerial Union shining light on Santa Rosa's underworld. Because of the ministers there was "a general topic of discussion almost everywhere." And what of our poor children? While patting his own back for avoiding "using language that is either unpleasant or suggestive," Finley complained The Citizen had shamefully printed "open, bare-faced and disgusting references to this unpleasant topic. As a result, the children have become almost as well posted on such things as their parents...what was once tabooed or mentioned only in undertones is now regarded lightly." Finley was particularly upset that the Union had "worked irreparable injury" to Santa Rosa's reputation by "forever trying to make the outside world believe that this is one of the worst cities in the land, governed by some of the country's most disreputable men." Take a moment to reflect upon his remarkable positions: The editor and publisher of the Press Democrat - and not incidentally, also president of the Chamber of Commerce - was clearly stating that criticism of public officials should be muted, and the cover-up of some types of criminal activity was a matter of civic duty. Also on Finley's enemy list were unnamed "interested parties" who had blocked the mayor's proposed solution to the prostitution problem. "Unofficially the administration had quietly been given to understand that quarters would be provided for them elsewhere in a less public part of the city," wrote Finley. Alas, in his view, the plan was killed because "petitions were gotten out and industriously circulated." What Finley didn't mention was that the grand scheme was to dump the red light district on the Italian neighborhood. In other words, town officials intended to keep the bordellos around, just not on such valuable real estate. Since Finley had earlier decried brothels in "the residence districts," he apparently viewed the Italian community as something lesser. But that didn't stop the Press Democrat from publishing an overwrought defense of Italian honor when it presented a new opportunity to attack the Ministerial Union. Judging from the two copies that have survived, The Citizen newsletter used most of its ink reporting on developments in the temperance movement, so it's no surprise that the August, 1909 edition noted that there had been 18 arrests in Cloverdale for public drunkenness that year. "[T]he number of Whites arrested for drunkenness was 10; Italians, 8," the item stated. Rev. Cassin of St. Rose fired off a letter to the PD that it was an "undeserved insult to the Italian population by excluding them from the list of white people." A spokesman for the Union replied that they intended no offense and regretted the "verbal inaccuracy." Cassin was not placated, and charged the "insult was given with malice aforethought" by the Ministerial Union. The Catholic church, recall, was not part of the Union, and its priest apparently shared Finley's animosities. Finley did not editorialize this time, but gave the letters prominent coverage with large type headlines. There were two snarky footnotes to Ernest Finley's wars of 1909. 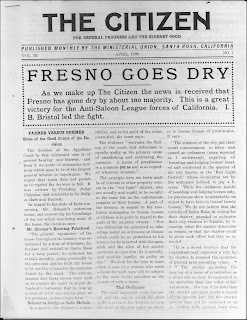 The Citizen ceased publication a couple of months after the Italian-White hubbub, and was followed by the "Sonoma County Advance and County Home Weekly," about which nothing is known. Noting that the journal would be published in Sebastopol, Finley sneered, "it will not be the first time outsiders have been good enough to come in to a town just previous to an election for the purpose of telling the people how to vote." The Press Democrat also ran a gossip item that Allen Lemmon's partner was trying to find investors to buy the Santa Rosa Republican from the 61 year-old Lemmon. "Inability to work together harmoniously is given as the cause," the PD added unnecessarily. Even for Finley, that was a low bit of work. Another issue of "The Citizen," published under the auspices of the Santa Rosa Ministerial Union, has made its appearance. And as usual, the little paper devotes most of its attention and space to The Press Democrat. Under the direction of three or four ministers with whose radical views we have been unable to agree, The Citizen has been hammering The Press Democrat for a long time. It never loses an opportunity of telling its readers what a bad paper this is, and how wicked its proprietors are. According to that authority, The Press Democrat is "the saloon organ," and "protector of vice," and it "stands for immorality." Needless to say, these things are not true, and The Press Democrat stands for nothing of the sort. In their narrowness and mistaken zeal the gentlemen dominating the so-called local Ministerial Union even went so far on one occasion as to attempt to institute a boycott against The Press Democrat upon the grounds that this paper was an enemy to society and a menace to the welfare and progress of the community. No criticism is too harsh for The Citizen to employ in its condemnation of this paper, and such has been its policy from the start. And in the meantime the people only laugh, because they know for themselves that the things charged against The Press Democrat by The Citizen are not true. The public does not have to be assured through these columns or in any other way that The Press Democrat has only the best interests of this town and community at heart. Its consistent record for more than fifty years as an exponent and advocate of the right is all the answer necessary to the mouthings of the men now working so hard to keep themselves in the limelight and who appear to be so very desirous of gaining control of public affairs here. During the last municipal campaign, the Ministerial Union was particularly active. Through its little "official organ" it kept things stirred to fever heat. It is no exaggeration to say that more ill-feeling was engendered here during the last city campaign than during any other similar period in all the town's history. The most bitter and uncalled for personalities were indulged in, and unfounded charges were hurled right and left with no thought of responsibility and apparently without regard to their truth or lack of it. In an excess of zeal that gave the movement the unmistakable stamp of fanaticism, vicious and uncalled-for attacks were made upon the out-going administration almost daily--although none of the men connected with that administration were candidates for reelection, while they had just successfully carried through a great work that should have and did earn them the grateful thanks of the community, and in spite of the fact that they represented our very highest types of mental and business ability, and our best citizenship. The effect of the irrational work carried on here during the last municipal campaign is still apparent in many ways. Feelings have been engendered that it will take years to allay, a good portion of the town is solidly arrayed against some of the things it ought to be and otherwise would be for, and valuable co-operation and support has been alienated which might just as well have been retained. The Citizen is now busy casting stones at Mayor Gray and the present administration with the same bitterness and lack of reason previously displayed toward the old council. One of its charges is that the officials now in authority have not reduced the number of saloons here. Mayor Gray and the members of the present city council did not run on the Ministerial Union platform, nor were they elected to carry out its policies. We only know of one new license that has been granted, and when the matter was passed up to Mayor Gray in open council he said he would do whatever the people living in that immediate part of town wished. Upon investigation, he found that only one person living or doing business within two blocks of that point was opposed in the license being granted, and that person was a man engaged in the same line of business. Without exception the others favored the granting of the license. Having given his word on the matter, there was only one thing left for Mayor Gray to do, and he did it. On the 26th of January the City Council passed a resolution favoring the reduction of the number of saloons in Santa Rosa and immediately afterwards, at the same meeting, granted an application for a license. Yet the truth is that the application was granted first, and the resolution passed afterwards, which, of course, gives the situation a somewhat different aspect. And not only does The Citizen mis-state the facts regarding this phase of the matter, but it is also incorrect as to the date of the meeting to which it refers. Of course it would have been no more trouble for The Citizen to verify these facts than it has been for The Press Democrat to do so, but The Citizen appears to regard facts as of no consequence. "Make your facts agree with your arguments," is The Citizen's motto, and always has been. In many respects conditions have been materially improved here since the present administration went into office, although no one would ever surmise it from reading The Citizen. There is little if any disorder, the poolrooms have been abolished, the town is carefully policed, and one of the first acts of the incoming administration was to rescind the ordinance previously enacted for the legal regulation of the redlight district--a law that appears to have been a little ahead of the times here, but which has the strongest approval of practically every important European community and many of the larger cities in our own county. And this brings us to a discussion of another charge being made against the administration of the Ministerial Union, through its "official organ." We refer to the existence of the district above mentioned, in its present location. Before Mayor Gray went into office--before he even thought of becoming a candidate, for that matter--he had a plan under way for moving the denizens of that part of town, and for transforming that valuable section into a public park. This was no particular secret, and after his election he proceeded with renewed vigor to try to carry the plan to a successful conclusion. Matters progressed to a point where considerable of the property was bonded, and notes was finally given certain objectionable tenants living in that part of time that they must leave. Unofficially the administration had quietly been given to understand that quarters would be provided for them elsewhere in a less public part of the city. But this information coming to the ears of interested parties in advance, petitions were gotten out and industriously circulated protesting against any action likely to result in the establishment of any similar quarter in any other part of the city. And strange as it may seem, this petition was signed by a number of these [people] who, previous to the election, had stated that they were in favor of doing just what the plan had in contemplation. The result of the petition was to leave the administration powerless in the matter, for it did not care to assume the responsibility of taking all restriction off of such traffic, which would have been and always has been, in any town where it has ever been attempted, the result of "driving them out." All the history of the world goes to show that when "driven out" this form of vice invariably returns in another and far worse guise, distributing itself through the residence districts, establishing itself in hotels and lodging houses, here, there and anywhere it can gain a foothold, and conducting itself in such a way that, except in rare instances only, is it possible to combat it under the law. We will have to confess that we much dislike to thus openly discuss a problem of this nature in these columns. The time has come, however, when this study should be understood. The world is not called upon to meet conditions as they might or as they should be, but as they actually are. The plain facts of the matter are that these things have always existed, ever since the days of Mary Magdalene, and before. No community ever organized has yet been able to stamp out the social evil. No community ever will. For this reason men who have really made a study of public questions and understand the world and its ways, are agreed that it is better to recognize the existence of certain omnipresent evils and do what can be done to restrict and regulate them, thus minimizing as far as possible their bad effects, rather than pretend not to see them and force the public later to reap the inevitable results of such mistaken policy. Contrasted to this, is the plan now in operation here and with certain modifications practically throughout the entire world--a plan which has for its basic principles the restriction of the area within which such people may reside; strict police surveillance at all times, and (where the plan is carried to its logical development) certain other features of a precautionary nature to which it is perhaps unnecessary here to refer. In penning these lines we have endeavored, as far as possible, to refrain from using language that is either unpleasant or suggestive. It will have to be admitted, however, that any adequate discussion of such a subject is difficult when one is thus restricted in his use of words. Unfortunately The Citizen appears to feel no such restriction upon its editorial utterances. For months its columns have been filled with the most open, bare-faced and disgusting references to this unpleasant topic. As a result, the children have become almost as well posted on such things as their parents. This handling and regulation of the evil has become a general topic of discussion almost everywhere, and what was once tabooed or mentioned only in understones [sic] is now regarded lightly. Under the circumstances, it is of course but natural that a certain looseness along social lines should have resulted. No other result was to have been expected. Yet the Ministerial Union doubtless imagines that it has accomplished a vast amount of good by its open, constant and flagrant discussion of these and kindred topics. Let there be no misunderstanding regarding this matter. We mean exactly what we say when we state that the discussion of these matters carried on by the Ministerial Union has been open and flagrant. Not only has the topic been discussed barefacedly in every issue of its official organ for months, but the policy of the organization as manifested in its mass meetings is open to the same criticism. "Women and young people are particularly invited," is the way a certain minister once closed his announcement regarding such a gathering, from his pulpit. It has remained for certain of Santa Rosa's ministers to inaugurate the custom of openly discussing such topics before and in the presence of innocent girls and respectable women. There an be no question whatever that this policy is all wrong. In our opinion it has worked irreparable injury not only to the rising generation here at home, but also to the reputation of the community abroad. Nobody will dispute the fact that the section complained of should be removed to another and less public part of town, for Santa Rosa has grown some during the past thirty years, and what was once an area of no particular importance is now surrounded with homes and residences. This is the idea entertained by the administration, and this is exactly what the administration tried to do. The question is, how can such a result be brought about? A public petition blocked it once. What will block it next time? Public sentiment would scarcely stand for the authorities taking the initiative in such a matter, even if they cared to do so. As officials and consequently as the guardians of the interest of all equally, what right have they to say that one part of town is any better than another. These suggestions give only a little idea of the difficulties that beset the administration in its attempt to handle this difficult and trying problem--a problem that has troubled public authorities ever since the world began, and to which the past and present political administrations of Sanata Rosa have probably devoted more study and thought than all the migratory gentlemen of the cloth who ever resided within the corporate limits. When the question was once up for discussion, it was seriously proposed that the entire matter be turned over to a commission, and that this commission consist of the Santa Rosa Ministerial Union. Perhaps this suggestion is still good. The gentlemen making up that organization would at least discover that the problem before them was more difficult than it looks and they might even be willing by going through the motions of "driving them out" to take the responsibility of removing all restrictions from the traffic. This is a responsibility that the municipal authorities refuse to take, flatly and absolutely. If the Ministerial Union will not consent to act as such a commission, perhaps it will come forward with some suggestion that might be of value. If it could give the name and location of any city or town in Christiandom where the social evil has ever been abolished, except perhaps a few days or a few weeks at a time, while some public agitation has been going on, it would be helping some. Up to the present time they have never done anything more helpful than to stand off and throw stones. But whatever course is pursued, let its final disposition be made quietly and as the judgement of the men entrusted with the problem may decide is for the best. The time has come when the open discussion of the subject must be stopped. The public is sick of it, and is beginning to resent it, as it should. The Press Democrat has never been the advocate of the saloon, or any of its allied interests. We have fought the so-called Ministerial Union in its attempt to secure control of public affairs here, just as we should fight a similar attempt upon the part of any other radical element, because we believe that to turn government in any form over to impractical men or theorists is unwise--yes, dangerous. As a matter of fact, Santa Rosa would be better off with half the number of saloons she has today, and with each one paying three times the present license. Aside from the fact that this is a great wine and hop producing section, in which to talk of prohibition would be inconsistent as well as unreasonable, there is a narrowness and provincialism about the very idea of a "dry" town that is displeasing to any man with experience and breadth of vision. Careful supervision and close restriction is a good thing, but there is no good reason why prohibition should ever be seriously talked of in a county like this. The Citizen reflects little if any of that broad Christianity or kindness of spirit that one would naturally expect to see manifested by a publication issued by ministers of the gospel. Harsh and uncalled-for criticisms, constant fault-findings, never-ending objections, make up the burden of its utterances. If the men responsible for the things appearing in its columns have ever been to any of the present municipal authorities to talk over the betterment of conditions here, or if they have ever proposed any likely solution for the difficulties complained of, we have never heard of it. The lash rather than the helping hand is The Citizen's way, and apparently the way of the so-called Santa Rosa Ministerial Union. We say so-called, because it is well know that the organization does not represent anything like the unanimous sentiment of the ministers of the city. Several refuse to have anything to do with the organization, and others who belong make no secret of the fact that they do not endorse the policies that have marked its course during the past two or three years. If the so-called Santa Rosa Ministerial Union really cared as much for the welfare of this community as it professes to, it would not be forever trying to make the outside world believe that this is one of the worst cities in the land, governed by some of the country's most disreputable men. My attention has been called to an article in the "Citizen" of August, 1909. In that article, page 7, speaking of the arrests in Cloverdale for drunkenness, it says: "The docket of Cloverdale precinct from January to June 1909, shows that the number of Whites arrested for drunkenness was 10; Italians, 8; Indians,0. When it is borne in mind that the White population in larger than the Italian and that the Indians have prohibition, etc." For he owes not any man." Italy was civilized and was the mistress of the world as it is today, the center of art, when, I venture to say, the country of the writer of the article in the "Citizen" was unknown or its people yet to be civilized. While the writer condemns so vehemently intemperance in drink, he should remember there is a greater intemperance he is guilty of--hatred for those who do not follow his opinion. "Not that which goeth into the mouth defileth a man; but what cometh out of a man this defileth a man."--St. Matthew xv:11. I sympathize with the Italian population for the undeserved insult offered to them in the "Citizen," and I sympathize with the cause of Temperance that has such intemperate supporters. Editor Press Democrat: In the paragraph on page seven of the Citizen for August in which those arrested for drunkenness at Cloverdale were classified as "Whites," Italians and Indians, there was no intention of casting any sort of reflection on the Italians or in anywise insinuating that they do not belong to the "White" race. The word "White" was used in a very loose sense and was meant to include all "Whites" other than Italians. It was an inadvertence, a verbal inaccuracy which we regret and we disclaim even the remotest purpose of offering the least insult to our Italian citizens. We are somewhat familiar with the ancient and honorable Roman and the long line of heroes, which "the Eternal City" justly boasts from the mythical Romulus to the patriot Mazzini and we would not, if we could, dim the radiance of one star that shines in the galaxy of Italy's immortals nor detract one iota from the glory of her race. Done by order of the Ministerial Union of Santa Rosa, Aug. 9, 1909. Pastor's Study, Methodist Episcopal Church, South. The paragraph in the August number of the "Citizen" was generally as a bitter insult to the Italians. An apology plain and humble was due to them, and this was looked for. What do the insulted Italians get? Only an explanation which repeats the insult. The Ministerial Union, while denying that they wished to differentiate between Whites and Italians, yet admit they wished to hold up Italian drunkards as apart from what they call "White" drunkards. They pled inadvertence, and verbal inaccuracy. This might be admitted in the case of one minister writing under the influence of hatred for the Italians, but a ministerial union should be able to correct the mistake of an individual minister. The idea of inadvertence and verbal inaccuracy cannot be admitted. The insult was given with malice aforethought ... [three lines of illegible microfilm]... They plead looseness of language. This plea cannot be admitted as they are aided by legal skill that should secure them from this pretended looseness of language. Now, as to the figures they give of cases of drunkenness in Cloverdale--"Whites" 10; Italians 8. It is said that figures do not lie, but some times they do not tell the truth. We may rest assured that the 8 cases of Italians represent the whole. There is no consideration for them. But what about the "Whites"? Do the ten cases represent the whole? Are they not sometimes taken home in a hack and their name and their number omitted from the list? I think this may be so in Cloverdale, and I know that it is so in a place much nearer to me than Cloverdale. In fine, the insult to the Italians by the Ministerial Union still stands. They have not and will not apologize as is duty bound. Their explanation does not explain, but repeats the offense. I again offer my sympathy to the Italians for the insult given to them by the Ministerial Union and for the repetition of it under the guise of an explanation. "The Citizen," formerly put out by the Santa Rosa Ministerial Union, is now a thing of the past, its publication having been discontinued. In an attempt to fill the void, Marcus L. Waltz, a Sebastopol real estate dealer and printer, has launched the "Sonoma County Advance and County Home Weekly," the place of publication being Sebastopol. Mr. Waltz says that in a few months he will move his plant to Santa Rosa and issue the paper from here. This is understood to mean that the change will be made election time. If so, it will not be the first time outsiders have been good enough to come in to a town just previous to an election for the purpose of telling the people how to vote. A report in circulation yesterday was to the effect that there would soon be a change at the Republican office, either A. B. Lemmon or J. E. Mobley being about to retire. Inability to work together harmoniously is given as the cause. Mobley is said to be trying to induce a number of Republican politicians to go in with him and buy Lemmon out.